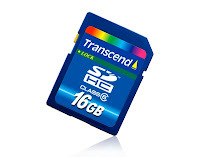 Those using SD Cards for their mobile phones, digital cameras and camcorders can now rejoice as Transcend announced that it will be launching its 16GB High Capacity memory card. The new 16GB SD cards from Transcend is already SD 2.0 compliant and supports FAT 32 system format. Class 6 compliant SD cards have transfer speeds of 6MB/s and also features an Error Correcting Code to minimize data corruption during file transfers. Translation: More videos, music and pictures for you to carry around on your SD compatible gadget.